Pompey Women had to settle for a point, despite twice leading against Plymouth in a National League contest at Home Park. Katie James and Jade Widdows both found the target for the visitors for a second week in succession. But Argyle hit back on each occasion, with Kayley Lane and Natasha Knapman scoring for the Pilgrims. Blues boss Jay Sadler had to follow the game from home, as his wife Natalie is expecting their second child, so assistant manager James Wilson took charge. Pompey kept faith with the side that secured a convincing 4-0 victory over MK Dons on home soil the previous week. They looked the brighter side in the opening exchanges and Becki Bath saw her low effort saved by Sarah Prior. The Blues were looking to attack down the flanks, with Bekah Tonks surging down the right and seeing her cross fly agonisingly out of reach for James. Their opponents were a threat from set-pieces and when skipper Katie Middleton met a free-kick, her ball back across goal somehow evaded everyone. Lane had an opportunity for Argyle moments later, with an attempt from outside of the box that was always rising and failed to trouble Hannah Haughton. 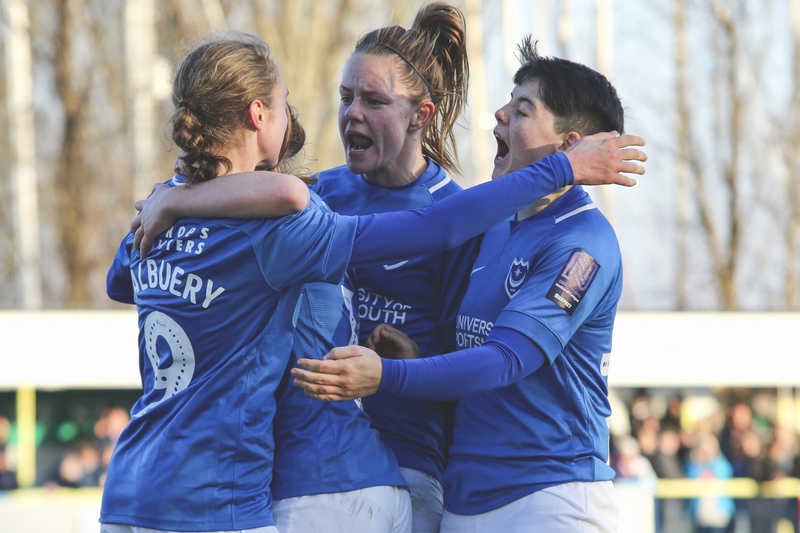 It was Pompey who broke the deadlock on 19 minutes, however, as James played a short corner to Rachel Panting, collected the ball back and fired home from long-range. But the home side soon found themselves level, as another flag-kick found Lane, who turned inside the box and slotted into the net. The action soon switched to the other end and James took the ball around Prior, but had to wait for the cavalry to arrive. That gave Plymouth the chance to get bodies back and when the ball was eventually teed-up for Bath, her shot crashed against the crossbar. Pompey did make their pressure count before the break, though, as Widdows caught Prior out with a shot from the tightest of angle. They might have increased their advantage in the closing stages of the first half, with Bath missing a couple of openings. The visitors tried another short corner routine once the action restarted, although this time the Pilgrims were alert and cleared the danger. Plymouth were trying to find a leveller and Amber Pollock surged into the area, only for her centre to be dealt with by Eilidh Currie. Lane then advanced down the right and picked out Jessie Jones, who saw her shot saved by Haughton. Pompey brought on Shannon Albuery for Bath and she managed to steal possession before firing narrowly past the post. James then attempted an ambitious bicycle to convert Panting’s delivery, but it failed to trouble Prior. Instead, it was Argyle who found the target, as Lane’s low cross into the middle was tucked home by Knapman. Haughton then had to race from her line to clear the danger and did well to get back to stop Jones scoring from the follow-up. Both sides chased a winner as the game entered its closing stages and a long-range James free-kick missed everyone and hit the bar. James then had a shot blocked after meeting Albuery’s cross, while Haughton claimed Middleton’s flick at the other end as the spoils were shared.